Global HVAC systems market expected to reach USD 265.2 billion globally by 2024, with a CAGR of around 6.9% between 2018 and 2024. Heating, ventilation, and air conditioning (HVAC) systems provide heating and cooling services. These systems control the indoor air quality, humidity, and temperature of buildings and vehicles. The report analyzes and forecasts the HVAC systems market on a global and regional level. The study offers historical data from 2015 to 2017 along with a forecast from 2018 to 2024 based on revenue (USD Billion). The assessment of HVAC systems market dynamics gives a brief insight into the drivers and restraints of the HVAC systems market along with the impact they have on the demand over the forecast years. 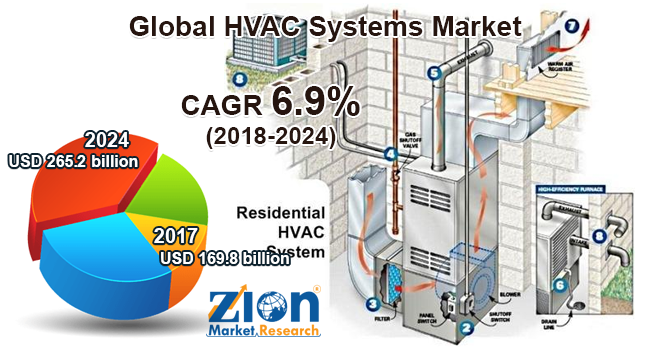 Additionally, the report also includes the study of opportunities available in the HVAC systems market on a global level. The report gives a transparent view of the HVAC systems market. We have included a detailed competitive scenario and a portfolio of leading vendors operative in the HVAC systems market. To understand the competitive landscape in the HVAC systems market, an analysis of Porter’s Five Forces model has also been included. The study encompasses a market attractiveness analysis, wherein heating product, air conditioning product, ventilation product, application area, and regional segments are benchmarked based on their market size, growth rate, and general attractiveness. The study provides a crucial view of the HVAC systems market by segmenting it based on heating product, air conditioning product, ventilation product, application area, and region. All segments of the HVAC systems market have been analyzed based on present and future trends and the market is estimated from 2018 to 2024. Based on heating product, the global HVAC systems market is divided into heat pumps, furnaces, space heaters, and boilers. Based on air conditioning product, the global HVAC systems market is segmented into the room/unitary air conditioners, chillers, VRF systems, coolers, and others. Ventilation product segment consists of air filters, air purifiers, centrifugal fans, roof vent, ventilation fan, and an air handling unit. Residential, commercial, automotive, and manufacturing are part of the application area segment of the global HVAC systems market. The regional segmentation comprises the current and forecast demand for the Middle East and Africa, North America, Asia Pacific, Latin America, and Europe for HVAC systems market with further division into the U.S., Canada, Mexico, UK, France, Germany, Italy, Russia, Spain, China, Japan, India, Thailand, Malaysia, Brazil, Argentina, Peru, Chile, Saudi Arabia, and United Arab Emirates. The competitive profiling of noticeable players of the HVAC systems market includes the companies and their financial overview, business strategies adopted by them, their recent developments, and products offered that can help in the assessment of the market competition. The key players included in this report include LG Electronics Inc., Daikin, Honeywell, Emerson, Electrolux, United Technologies, Johnson Controls, Ingersoll-Rand, Nortek, Lennox, Samsung Electronics, Hitachi, Mitsubishi Electric, Panasonic Corporation, and Whirlpool, among others.